Dublin native Fran O’Leary demonstrates technique acquired from many years of coaching and playing both in the United States and Ireland. 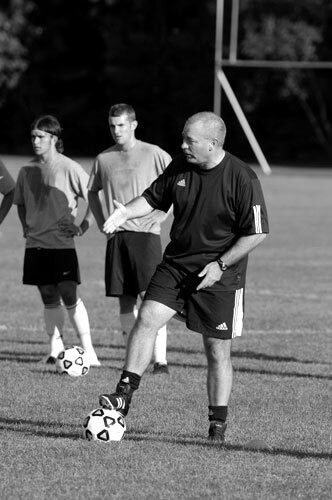 What began as a short "holiday" in the United States for the new Bowdoin Men's Soccer Coach, Fran O'Leary, has turned into nearly two decades of coaching and living in this country. O'Leary replaced Brian Ainscough, who recently departed Bowdoin after five successful seasons to coach at Northeastern University in Boston, Massachussetts. A veteran of coaching, O'Leary brings a vast background of coaching experience to the team. O'Leary left Dublin, Ireland, in 1986 during a period of heavy emigration. He landed his first coaching job at Boston College as an assistant coach for the soccer team. Since accepting his first position at BC, O'Leary has gathered lots of coaching experience. He got his first head coaching job at Division III Elmira College in New York. In 1992, O'Leary became head coach at Kenyon College and led the men's soccer team to the NCAA Semifinals. He took his first Division I head coaching job at Dartmouth, where he boasted an impressive record. In 2000, the New England Intercollegiate Soccer League voted O'Leary Division I Coach of the Year. Following seven successful seasons at Dartmouth, O'Leary moved south to coach at George Mason University before coming to Bowdoin. O'Leary, who fondly remembers his time at Dartmouth, had little difficulty deciding to move to Brunswick with his family. "We wanted to return to New England. We wanted to move back into a college community. I wanted work again at a top private school. When the job came open, it was a pretty easy decision." Looking ahead to this season, O'Leary is calling upon the team, especially the upperclassmen, to determine the goals. "I've always asked the upperclassmen to have a dialogue with the rest of the team to determine what is feasible. The team is going to let me know next week." O'Leary remains confident in his team's ability and motivation. He credited former coach Ainscough with the quality of the personnel. "Brian [Ainscough] left me with a great bunch of lads" said O'Leary.